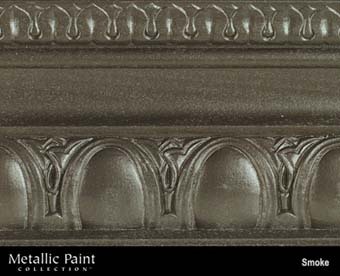 Paint Colors :: MANUFACTURERS :: MODERN MASTERS :: Metallic Paint Collection :: MODERN MASTERS METALLIC PAINT 99825 ME-243 SMOKE NT SIZE:6 OZ. UGL 13512 ZAR 135 CHARCOAL WOOD STAIN SIZE:QUART. MINWAX 42090 NATURAL 209 STAIN SIZE:PINT. DUCKBACK DB-6020-4 PATINA GREEN MASON SELECT TRANSPARENT CONCRETE STAIN SIZE:1 GALLON. CABOT STAIN 51106 NEUTRAL BASE WATER- BASED SEMI-SOLID STAIN SIZE:5 GALLONS.